Aloha Protein is marketed as one of the healthiest meal replacement shake options. Their product is certified organic, gluten-free, dairy-free, and non-GMO. On top of that, the company works hard to be as green and sustainable in their business practices as possible. After looking into their claims, we were pleased to see them backed up by their product’s ingredients! Aloha’s ingredient list is impressively clean. The completely plant-based protein blend notably does not contain soy but instead consists of pea protein, pumpkin seed protein, and hemp seed protein. From this, each serving has 18 grams of protein with a well-rounded amino acid profile. The pea protein is easy to digest. Hemp protein is another popular plant-based protein, also prized for its easy digestibility and high fiber content. Pumpkin seed protein is less common, but the seeds are well known to offer a range of health benefits including an impressive nutritional profile and a range of amino acids. The only slightly troublesome ingredients are the coconut cream and coconut sugar. Coconut cream causes this shake’s fat content to be higher than some other comparable shakes (Aloha has 4.5 grams per serving; similar shakes have just 2 grams or even 0). 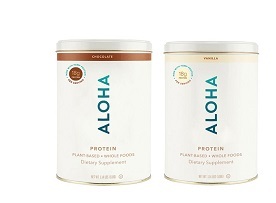 Aloha uses coconut sugar to sweeten their protein powder. While this sweetener has been marketed as low-glycemic and a safe, all-natural sugar alternative, the facts about these claims are at best fuzzy. Aloha protein has 4 grams of sugar per serving. It’s not crazy high, but comparable shakes have half that amount or less. Aloha meticulously avoids artificial ingredients, and has gone out of their way to make their product friendly to a variety of dietary needs (the product is certified Kosher, vegan, gluten-free, and soy-free, and the ingredient list doesn’t list other common allergens like corn or tree nuts). This is a shake to make vegetarians and vegans happy. The only downside is plant-based protein can have taste and texture issues you don’t encounter with whey-based proteins. Aloha Protein is a good choice for your shake. Overall, the ingredient list and nutritional profile makes a good impression. The price might hurt some budgets, and the taste/texture of the plant-based protein may not suit everyone’s palate. But if you have allergies or follow a restricted diet, this shake might be just what you need! What's Better than ALOHA SHAKE MIX?